OEKO-TEX is pronounced Eco-Tex. The OEKO means eco as in ecology, coming from the Greek word oikos [οικος] (household) and oikonomos [οικονομος] (household management, economy). TEX simply means textiles. In a sense, oeko is used here to refer to both the household and the ecology, since textiles are tested to ensure that there are no substances harmful to the users (as in a household) or to the environment. OEKO-TEX started as a joint venture of two independent national textile testing organizations, the Hohenstein Institute in Germany and ÖTI in Austria in 1992 to ensure that textiles made in Europe are safe. Since then, fourteen more national testing-certifying organizations have joined OEKO-TEX, bringing its membership to sixteen in Europe and Japan. Since OEKO-TEX is independent, not governed by textile manufacturers or their associations, it is a third party certifying body, issuing the most trusted type of certifications. The testing operations of its members meet ISO 9000 certification. The current membership is Aitex – Instituto Tecnológico Textil (SPAIN), Centexbel (BELGIUM), Centrocot (ITALY), Citeve (PORTUGAL), MIRTEC S.A. (GREECE), DTI – Danish Technlogical Institute (DENMARK), Hohenstein Textile Testing Institute (GERMANY), IFTH (FRANCE), Innovatext (HUNGARY), Institut Wlókiennictwa (POLAND), Nissenken Quality Evaluation Center (JAPAN), ÖTI – Institute for Ecology, Technology and Innovation (AUSTRIA), Shirley Technologies Limited (UNITED KINGDOM), Swerea IVF (SWEDEN), Testex AG, Swiss Textile Testing Institute (SWITZERLAND), and Vútch-Chemitex (SLOVAKIA). The International OEKO-TEX® Association stands for “Confidence in Textiles”. As independent textile testing institutes, we work for enhanced product safety and sustainable production in the textile value chain through continuous improvement. Originally, the testing and certification of textiles made in Europe helped the European textile industries by helping them meet certain high standards, then certifying that they had met those standards. They were facing price competition from Asian manufacturers, and this set them apart from Third World fabrics of questionable quality and healthfulness. 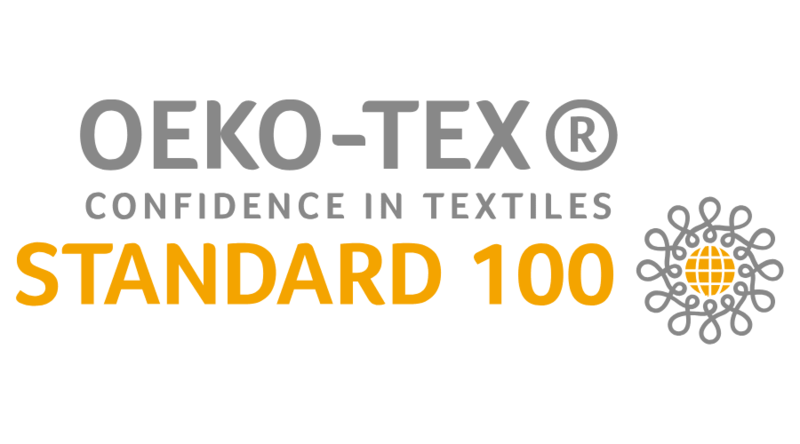 Since then, the OEKO-TEX Standard 100 certification has become the required standard worldwide for all kinds of fabrics. In 2011, the Specialty Sleep Association in North America adopted the OEKO-TEX Standard 100 for fibers and fabrics used in mattresses made by its members. Now OEKO-TEX members have offices and testing laboratories in most nations with significant production of fibers and textiles. This is the recognition that those places could not succeed in selling their fibers and textiles to be used in product manufactured or assembled in Europe and North America without meeting the OEKO-TEX Standard 100. OEKO-TEX has three certifications: OEKO-TEX® Standard 100, OEKO-TEX® Standard 1000, and OEKO-TEX® Standard 100Plus. OEKO-TEX® Standard 100, described above, has a list of over 100 substances (chemicals and metals) which are restricted or prohibited in fibers, the materials made from them, and dyes and finishes, as well as bleaches and other processing substances. For finished products, the standard applies to thread, zippers, buttons and other accessories. OEKO-TEX also has a leather standard. Even though OEKO-TEX standards apply to fibers, textiles and the products made from them (such as garments, curtains, sheets and mattress covers), some manufacturers of other products (for instance, Tempflow) refer to these standards when their products meet or exceed them. OEKO-TEX® Standard 1000 certifies the facilities and manufacturing equipment used in producing textiles. The standard extends not only to chemicals used, but to safety and wages, effluents (waste water and air emissions), and other related factors. OEKO-TEX® Standard 100Plus combines the previous two into one standard. It means that the textile or finished item is free from harmful substances and has come through a clean chain of production. OEKO-TEX and its members have laboratories and offices on all inhabited continents. Globally, it is the most widely sought after and used certification for fabrics, including those used in mattresses and pillows as well as bed linens.